The project site was adjacent and in close proximity to the County’s existing jail. The new jail includes minimum, medium and maximum security housing, intake, visitation, classrooms, outdoor recreation areas, a full-service kitchen, sallyport and other support areas. 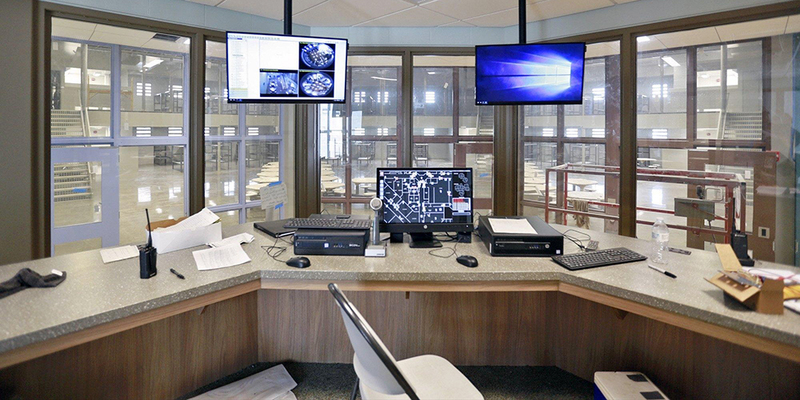 The project combined three smaller facilities to increase staff efficiency, provide a more secure facility, combine Sheriff department staff and replace the existing jail. The structure is a deep augercast pile foundation system with load bearing masonry and precast concrete plank. A new centralized mechanical penthouse services the facility. Granger was responsible for obtaining local building and trade permits. The project utilized BIM Coordination to develop a 3D computer model for the coordination of building systems installation. This process has identified a number of potential conflicts with different piping, ductwork and structural elements that were resolved prior to material being fabricated, which minimized the amount of subcontractor change requests that are costly and cause schedule delays. To keep communication about the status of the project open and transparent to the community, Granger provided and managed a dedicated project website.